Rare are the people who can say they’ve sat at a handful of World Series of Poker Main Event final tables or more. The record holder is Gary Philips Sr., who has dealt at an astounding 10 of them. Among players, the top names are Doyle Brunson (who has of course won the event twice) and Jesse Alto, a well-known grinder in the pre-poker boom days. And then there’s Shaun Harris, who has earned his seat at 5 final tables by being one of the best poker dealers in the world. 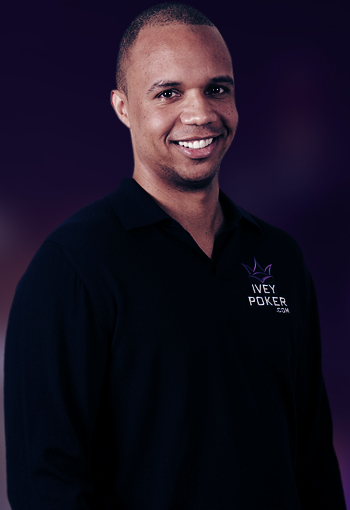 He’s sat across the felt from the biggest names in the game, including Phil Ivey and Daniel Negreanu (who know him by name) as well as others like Erik Seidel, Jonathan Duhamel, Bobby Baldwin, Phil Hellmuth, Michael “the Grinder” Mizrachi, and more. 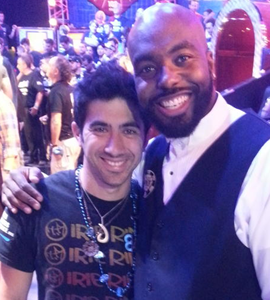 Over the last few months, Harris, better known as “Shaun the Dealer” in poker circles, has begun to develop a tremendous fan base on Twitter, where’s he’s posted plenty of pictures with all those pros. 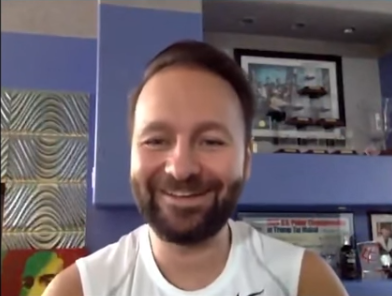 Having the best seat in the house at poker’s most important series of events (including the Big One for One Drop, $50,000 Poker Players Championship, and Tournament of Champions) gives Shaun a truly one-of-a-kind perspective on the players and the WSOP itself. It’s no surprise then that fans of the game have started to “follow” him too. Shaun was kind enough to grant Cardplayer Lifestyle this exclusive interview. 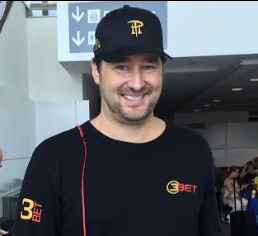 We hope you enjoy this in-depth look at one of the most fascinating personalities in poker. Cardplayer Lifestyle: Most of our readers have seen you before on many ESPN broadcasts over the years at dozens of featured tables, but they probably don’t know too much about you. Tell us a little more about yourself. Shaun Harris: I’m 34 years old and was born and raised in New York City. After graduating high school in 1995 I went straight in to the military (Army). After 5 years in the service, I left the military, went back home, and sought work. I also reunited with my high school sweet heart, Alice. I ended up becoming an editor’s assistant for a major New York newspaper. In 2001, Alice was diagnosed with leukemia. She passed away in late 2002. I fell in to a little depression, quit my job, and basically did nothing. 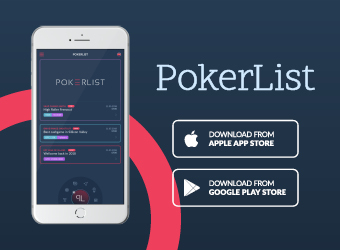 CPL: How did you get involved with poker and with dealing? SH: Early 2003, I get a call from an old army buddy who was living in Washington state. He informed me that he’d be deployed within that year and wanted me to move cross-country, be his power-of-attorney, and take care of his house and belongings while he was gone. He also informed me that he’d have a job as Casino Security lined up for me, as he was the Surveillance Manager at the time. I packed up my things and moved in November, 2003. I worked security for a few months before someone suggested that I try my hand at dealing table games. I inquired about poker (only because I saw that the dealers sit down their entire shift). I was asked if I knew how to deal poker and I told them I did. The only thing I knew about poker was what I saw walking past the tables while performing my security duties. I was told I had an audition in a week. That entire week leading up to my audition I practiced shuffling, learned the ranking of the hands, and learned the basic poker dealing fundamentals (blinds, button, check, call, raise, etc.). Aside from the shuffling and ranking of the hands, everything was self-taught. When it was audition time, I absolutely nailed it. The hiring manager asked me how long I had been dealing. I told her it was my very first time. She was amazed. The next available 4-day weekend, my girlfriend at the time and I drove to Vegas so I could audition. The audition consisted of dealing a couple of hands in the Rio’s Daily Noon Tournament. I sat down, dealt 3 or four hands, and that was it. Next thing you know, I was on my way to applying for my gaming license. The rest is history. CPL: Have you always been employed by Caesars Entertainment? For how long? How many WSOPs have you dealt at? SH: I’ve been employed by Caesars Entertainment (formerly Harrah’s Entertainment) since December, 2005. I worked at Mandalay Bay for 2 months after the 2005 WSOP. Caesars Palace was scheduled to open their 60-table poker room in December. That was when I made the switch. I worked there until May, 2007. 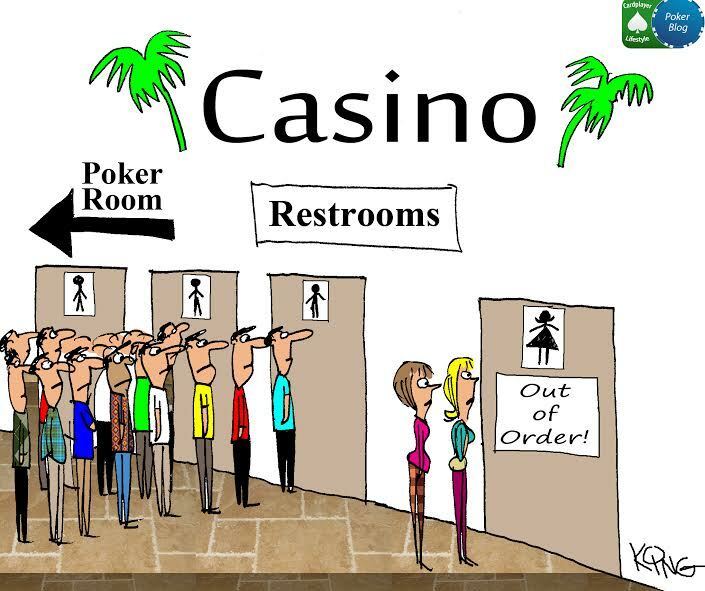 The poker room manager at the time fired me because I wanted (and tried) to work both Caesars and the WSOP. You see, the company had handed out a memo stating that an employee of the company couldn’t work 2 places at once. “Moonlighting” is the term. The previous year, employees were allowed to, but a lot of them couldn’t handle the workload. They’d miss a shift at one job, show up late, or call in sick. So, in 2007 they did away with that. The termination proved to be a blessing in disguise. That was my breakout year at the WSOP. That was the first year I dealt the ESPN televised tables. I haven’t looked back since. 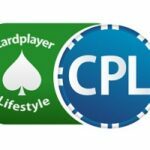 CPL: Have you ever dealt at private high-stakes cash games? If so, could you share some stories about some of the players you’ve dealt to? SH: I didn’t deal any “private” games per se, but I have dealt many “closed off” high-stakes cash games. When I worked at Caesars, I was chosen to deal an Omaha heads-up match between Gus Hansen and Sammy Farha. Gus was doing really well, and I mean “realllly” well. I was told by other dealers that Mr. Farha could be harsh, so I was kinda ready for it. On the contrary, he was the EXACT opposite. Although he was losing big to Hansen, when the game ended he said, “Don’t worry, Dealer, it wasn’t your fault” and he tipped me $100. 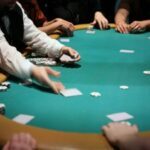 CPL: Do you prefer dealing at cash game tables where you get tipped or at featured tables in tournaments where you get televised exposure? SH: I enjoy both, almost as equal as the other. There’s a lot of exposure and “poker publicity” in the tournament world. Honestly, tournaments are the reason why I’m getting the exposure I’m getting (which is still surreal to me). However, cash games are my bread and butter. I’m a pretty fast and efficient dealer. 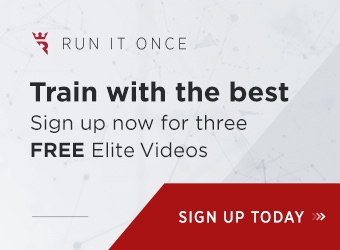 Dealers who are fast, efficient, and, most of all, accurate, are the ones who fare rather well in cash games. A great personality goes a very long way as well. CPL: The first time you dealt at a featured table on camera, were you nervous? SH: I wasn’t nervous at all. I think that’s because I didn’t understand the magnitude of what I was doing. Everyone told me I was lucky and fortunate to deal the televised events and final tables, but to me it was just another table. It wasn’t until 2010, when I was dealing to Jonathan Duhamel and John Racener heads-up, that I started getting nervous and whatnot. My palms got sweaty from time to time and what was once automatic to me became tough to remember: The small blind is on the button … deal to the big blind first, etc. This became a mantra I repeated in my head over and over again. CPL: Do you ever get nervous anymore when millions of dollars are at stake? What’s it like to know that the next card you turn over will change someone’s life forever? SH: I never get nervous when millions of dollars are at stake. To be honest, with the exception of 1st place, I never know how much the players are playing for. I probably wouldn’t even know what 1st place paid if it wasn’t mentioned by every magazine and every poker fan. I totally tune it out. It sounds weird, but it’s true. I never get wrapped up in that or really think about it. I honestly think that’s what makes me a “good” dealer. I never get wrapped up in the poker hype or media. 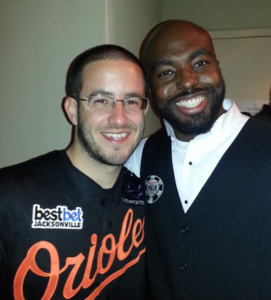 CPL: What’s your most memorable World Series of Poker moment of 2012 and of all time? SH: My most memorable moment of 2012 was when the crowd was chanting, “Shaun-The-Deal-er”. From what I was told, that was the first time in final table HISTORY that ever happened. It’s awesome that I, a dealer, got praise like that. I really don’t think the media, fans, players, and upper-level management realize how important our task is. I think “dealer praise” was long overdue. I believe all dealers should get the praise and love the way I did that night. My most memorable moment of all time, aside from dealing the winning hand to Greg Merson a couple weeks ago, was talking to Dennis Phillips between hands at the final table (in 2008). He was sitting in seat 1. We were on a little break, I look over to my left, and he was either shuffling chips or counting his stack, I forget. Anyway, I look over and I asked him “How are you holding up, man?” He looked at me, smiled, and said “You know, I’m tired, but I’m having the time of my life right now.” I replied, “Sir, that’s awesome. I’m a little tired too. Let’s both kick it into high gear and make this happen.” That little exchange has made us buddies ever since. Another memorable moment was when I was dealing a featured TV table. 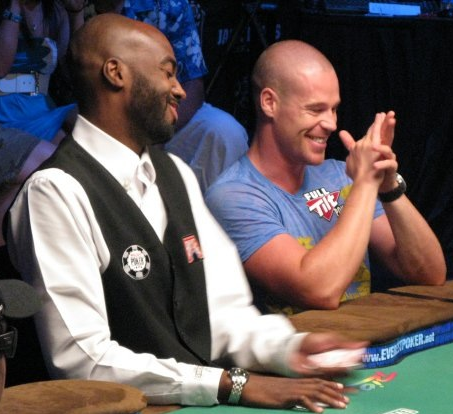 Patrik Antonius was sitting next to me in seat 1 and I remember him having a rock solid poker face throughout. I leaned over and said, “If I deal you a monster, you better smile.” Sure enough, a few hands later, he was dealt a big hand. After the hand I leaned over again and, before I could say anything, he cracked a smile … we both started laughing a little. A fellow dealer caught this amazing shot of that (see below). CPL: Do you deal exclusively in Las Vegas or also at other WSOP-branded events around the U.S. and the world? SH: I only deal the WSOP in Las Vegas. I don’t do any of the other circuit events around the country or the rest of the world. I’ve always wanted to travel and deal the other events, but the cost for a dealer to do so is pretty high. Our expenses are more than people realize. At the end of the trip, a lot of us would be lucky just to break even. Some dealers don’t mind that; they go for the traveling experience, as well to have a “working vacation”. Personally, I’d need it to be financially profitable and it really isn’t. CPL: Word in the poker community is that you’re retiring from dealing? Why? What are your plans for the future? SH: I’m not necessarily retiring from dealing as a whole. I’m “retiring” from the WSOP. I’m looking forward to possibly making a run at it next year. I’m also playing A LOT of cash games. I’m working up a nice bankroll to finance my future endeavors. Throughout the year I’ll still deal at the Rio, where we have a nice 10-table poker room. I work the graveyard shift (midnight–8 am and 1 am–9 am). As a Caesars Entertainment employee, I’m not allowed to play any ring or bracelet events (other than the Casino Employee Event). So, between now and May 2013 I’ll be on a serious grind so I can officially “retire” from the WSOP. 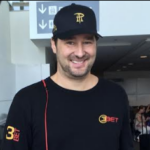 I also plan on dealing other high profile events abroad, specifically the PokerStars Caribbean Adventure (PCA) in the Bahamas and EPT Monte Carlo. CPL: Shaun, it’s been great speaking with you. Thanks for taking the time to interview with us here at Cardplayer Lifestyle, and best of luck at the tables! SH: No problem. I had fun doing it! Your first sentence is incorrect and I am living proof. Hi Gary – my most sincere apologies… I surely didn’t mean to offend and I try to do good, proper research before publishing. I’m truly sorry but I honestly hadn’t heard of you until I saw your name popping up in Facebook comments on Nolan Dalla’s posts… It seems similarly tough to find information about you online… there are a lot of “Gary Philips” out there. 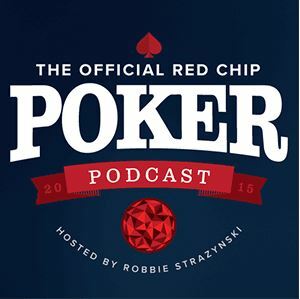 Could I ask you to please send me the details of your 5 WSOP final table appearances? 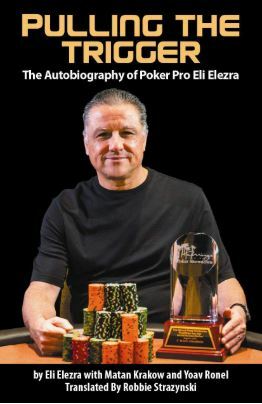 robbie@cardplayerlifestyle.com Looking forward to hearing from you – and of course I will then adjust the intro to this article appropriately. Dealing the final table of the big event is in my opinion the highest honor a poker dealer can achieve. I do not in any way want to diminish Shaun’s accomplishments. He has done very well. However he does not have the record. To my knowledge I do. It’s twice the number of Shaun’s. Ten to be exact. Here they are in chronological order: ’84 – Jack Keller; ’85 – Bill Smith; ’91 – Brad Daugherty; ’92 – Hamid Dastmalchi; ’93 – Jim Bechtel; ’94 – Russ Hamilton; ’96 – Huck Seed; ’97 – Scotty Nguyen; ’98 – Stu Ungar; and my last $10,000 Championship Event Final Table dealt was ’99 – Noel ‘JJ’ Furlong. I’m glad a good poker dealer like Shaun is getting some recognition. Our profession is mostly a thankless one. The good ones are seldom noticed. They come in, run the game proficiently, make no mistakes and leave without most players remembering he/she was even there. My pleasure Gary… please note the first paragraph has just been updated. Thank you again so much for your comment and introducing yourself. Please send me an email – I would like to interview you, if you’re interested, for a future piece… no rush; at your convenience sir. Here, here! That’s precisely one of the reasons we wanted to interview him in the first place. As mentioned, I’d be happy to do a future piece on you Gary. I’m big into respecting the origins of the game and the people who’ve been involved since the beginning in helping make it what it is today. Clearly, you were at the heart of it all multiple times and it would be great for me personally and for our blog’s fans to get your unique perspective. gd job shaun…made in manhattan baby! I have known Shaun the Dealer since he worked at Caesars and he was one of the main reasons we really loved the room. When he left, it was a very different mood there. Shaun is such a wonderful, generous and amazing person!!! Gives great hugs as well!! !